Liverpool’s second-half performance in Munich was the best I have seen them play in the past year, including the exhilarating wins that took them to last season’s Champions League final. 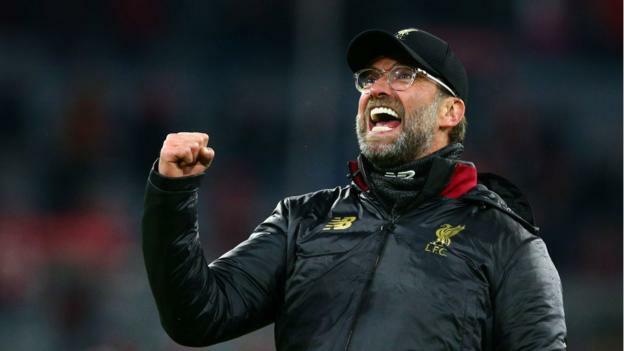 Tactically, manager Jurgen Klopp got it absolutely spot on because the Reds were everything they had to be during those 45 minutes at the Allianz Arena. At half-time, with the score 1-1 on the night, the tie was still in the balance. I was worried at the way the momentum had started to shift just before the break because Bayern were beginning to knock the ball around nicely. To see their threat off, Klopp needed his side to be tighter defensively but carry more of a threat at the other end, and boy did they do that. At the back, Virgil van Dijk was pure class again and of course he scored the crucial second goal too. The way he attacked the ball from James Milner’s corner, no-one was going to stop him. Up front, Sadio Mane was impressive too – but he was not the only one. A lot has been said about the form of the Reds’ front three recently, because they were ordinary at Old Trafford and Goodison Park, but here they showed how difficult they are to stop when they get the right supply, and they get given the ball early. It was an outstanding performance, but totally different to the type of swashbuckling attacking display that Liverpool were known for last season when Klopp’s side needed to have spells in games where they blew teams away because they were vulnerable at the back. Wednesday’s performance was more like the kind you get used to seeing from the leading continental teams in this competition, where they take total control of what could be a difficult tie and progress comfortably. That is exactly what Liverpool did. I have never been in this stadium and seen it empty so far in advance of the final whistle before, because it was clear for a long time that there was no way back for Bayern. Klopp was right when he described Liverpool’s performance as “mature” afterwards because it was a display that underlined the progress that his team have made, especially when you consider the circumstances. We know this Bayern side are not the force they were three or four years ago, but in their own stadium they are a real threat and they had a formidable record to protect. The German champions had only lost three of their previous 30 home Champions League games since the end of 2013, all of them at the hands of Real Madrid, who went on to win the competition on each occasion. Now Liverpool have come away with a result that will make anyone who missed the game say ‘wow’ when they see it. Klopp says he wants to avoid another English team in the quarter-finals when the draw is made on Friday, and I can understand why. He will not be afraid of any of the teams left in the competition but the English sides know so much about each other. Playing Manchester City, Manchester United or Tottenham over two legs would be more like a Premier League meeting than a European tie. I make City favourites to win the trophy in Madrid in June, because they have got the best squad and an unbelievably driven manager, but Liverpool are not far behind. They are very dangerous opponents, because of their experience from last year and the improvement they have made since. They used to be a very up and down side but consistency is now one of their strengths. Part of that is down to their team selection – when I watch them there are a lot of constants. They don’t really chop and change very much, apart from in midfield where they have got a lot of quite similar players to bring in and out of the side. The one down side of Liverpool’s progress in Europe is that I do think it will affect their Premier League title bid. A lot of the same players have already played a lot of games, and when you get to the last month or two of the season then tiredness does become a factor. But Klopp will not be complaining because they are going to get to the end of March in an absolutely fabulous position in the two most important competitions. That is the situation he would have wanted at the start of the season. Now they just have to keep on winning, because that is what City are doing. Liverpool’s next test is to go and win at Fulham on Sunday, which might sound easy after what they have done in Munich, but won’t be. They cannot afford to let their levels dip at all but then Klopp is in charge, so there is no way he will let that happen.